Joshua Williamson’s run on The Flash hasn’t been perfect but it’s one of the few books that I can expect a high quality from since Rebirth began. We’ve just come off of the Flash War storyline which I found very entertaining. 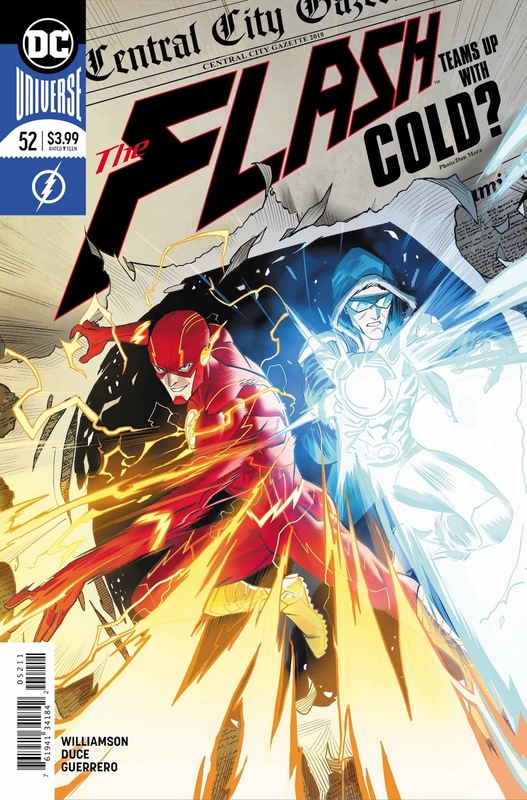 Now, the previous issue was an epilogue for that storyline and that was really a waste of everyone’s time but now we are officially going into the post-Flash war part of this book and I’m excited to see how these new additions to the universe and book will change things for us going forward. Barry and Wally have unleashed new forces on Central City when they broke through the Speed Force. In addition, Commander Cold from the future is now stuck in the present. Let’s stop talking about it and just jump right into this issue to see what is in store for us. 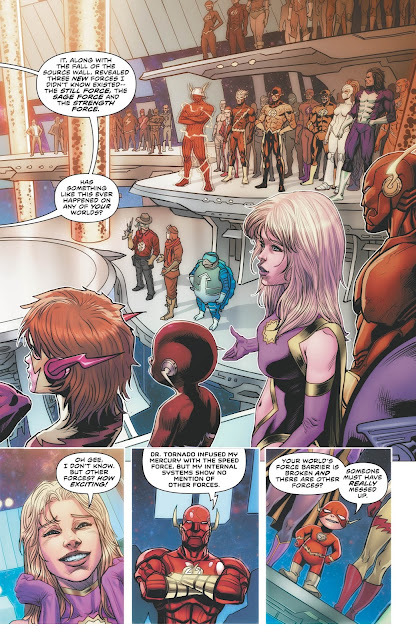 Our issue begins with Barry meeting in a space station. It is the House of Heroes and The Flash has brought all the Flashes from other worlds to ask them for their advice when it comes to these new forces that have been unleashed on his world. Seeing all these different Flashes from different worlds is really cool but the scene ultimately seems kind of a waste of time as none of them seem to know anything about these new forces. 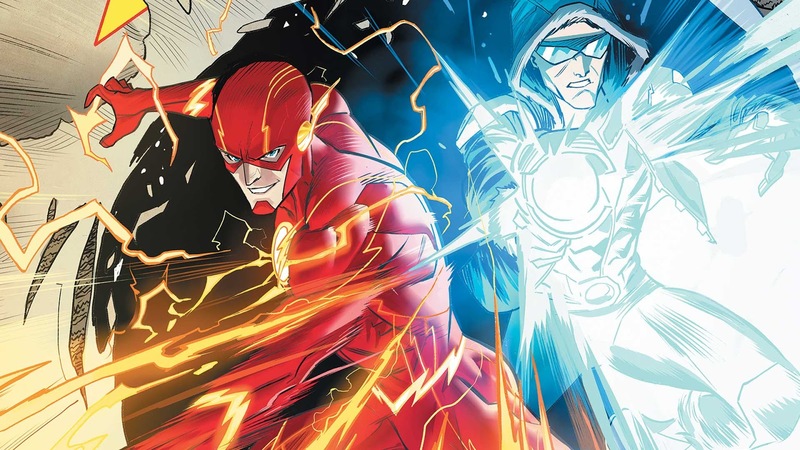 Some of the Flashes suggest that Barry go to explore the Speed Force for answers. Barry runs off and dismisses these ideas though as he cannot leave Central City at the moment. 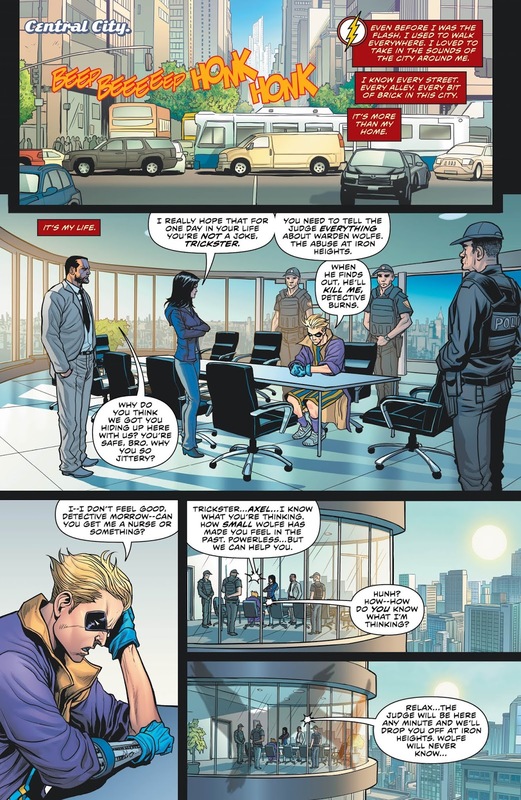 Meanwhile, back in Central City, Trickster is being interrogated by some police officers. They are trying to put Warden Wolfe away for his abuses at Iron Heights. Trickster seems uneasy about talking with a judge because Wolfe will come for him. The police give him reassurances but it doesn’t seem to calm him down. He even seems to be a little ill. However, the judge never arrives as their meeting is interrupted by two bird people crashing through the window. They are the Para-Angels and they’ve been hired to make sure Trickster only talks to the right people and apparently the cops are in that list. The Para-Angels succeed in abducting Trickster and his arm falls off in the struggle. They seem to feel secure until the Flash jumps from a building to engage them. 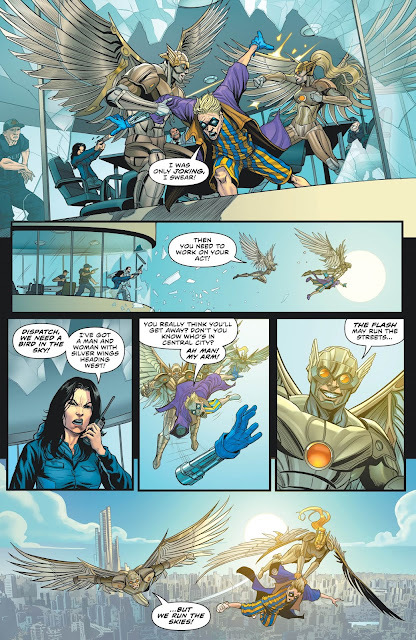 In order to get the Flash off of them, the female Para-Angel attempts to kill Trickster by throwing him to the ground below. The Flash is able to save him but the Angels are getting away. This is when Commander Cold arrives on his hoverbike to aid The Flash. He freezes both of the Angels but the Flash has to act in order to prevent the female from shattering on the ground. The Flash and Cold start arguing and this gives Trickster the opportunity to flee the scene. He keeps commenting about how he’s feeling sick and just as he has gotten away, the ground opens up and swallows him whole. Because of this, The Flash loses Trickster and blames Commander Cold for it. Back in Iron Heights, the cops are getting into an argument with Warden Wolfe after they allowed one of his prisoners to escape. Meanwhile, Barry and Kristen chat. Kristen briefly refers to a case she’s been building but quickly changes the subject to Barry and Iris moving in together. We cut to their home and Barry is working on finding Trickster while Iris works on her latest story. Iris is still getting memories from a past life and one strong memory is her wedding to Barry. Then Barry is contacted by Cold and he rushes off to meet him. The two meet where Trickster disappeared and Cold begins explaining that he believes that Trickster was changed by one of the new forces. This is when a fist breaks through the ground beneath them. It’s Trickster who has been empowered by the Strength Force. He quickly defeats The Flash and Commander Cold and then sets his sights on Iron Heights and Warden Wolfe. This issue is a jumping on point for a lot of readers. At least, that’s how the issue is set up. 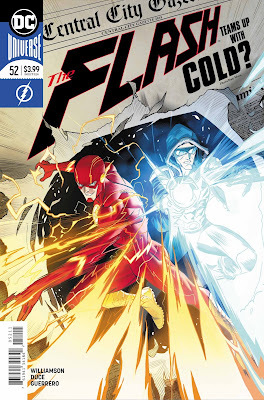 The first couple pages are about a meeting between different Flashes but while it’s cool to see those characters, the meeting is basically meaningless. However, it does set up a possible journey into the Speed Force. A lot of this issue is setting up things to come. It establishes that Wolfe is under investigation, that Barry and Iris are living together, that Iris is still having visions, and the new forces are in Central City. There’s a lot of parts that I like about this issue. I like that Barry is trying to adapt to having a new partner. I like that Trickster, who is most often seen as a joke has suddenly gained new powers that help him easily defeat the Flash. The story of a villain who was always pushed around finally being the one that can stand on his own is really interesting. However, most of this issue is set up and that can only be so interesting. This issue is a lot of set up. It establishes what is happening across all the characters involved in this book at the moment. The book jumps around a lot which doesn’t allow any of these storylines to really progress but I don’t dislike any of them. I’m legitimately interested by almost every subplot but I just didn’t get a lot of any of them to really sink my teeth in. However, this is an issue to just set up where things go from here. I’ll give them the benefit of the doubt and look forward to seeing how this book goes forward.